A NEW RACE OF HYBRID ALPINE IRISES. This addition to the race of early spring-flowering Irises is the result of many years of experiment in hybridizing Irises, undertaken, in so far as the plants of this section of Iris is concerned, with a view to the improvement of that very promising little group of dwarf bearded Iris which are the first of all the rhizomatous Irises to bloom in the spring, and are included under the names of biflorus, Chamaeiris, ( Olbiensis, pumila, etc., which have one or two varietal names to add to their list, but were still very limited both in number and in the range of colour they presented, having nothing of the gorgeousness that the numerous varieties of tall bearded or " Flag " Irises had accustomed us to connect with the word Iris. This lack of variety in colour was a considerable bar to any chance of popularity they and that they did deserve it was evident from their many other qualities: their freedom in blooming, their acceptance of and delight in a windy, exposed position, where other plants could not thrive; their hardiness, and power to withstand extremes of weather, nourishing on a dry bank where grass was unhappy, and being withal, at every season of the year, neat and cheerful-looking plants, with a pleasant contrast of character in their foliage to all other plants in the border, looking after themselves for the most part, and satisfied with an occasional clean up of weeds and dead leaves, happy in the privilege of being let alone. Questions which had to be considered at the outset were: What should be done to impart new colours, and to improve the old? Would Nature herself do it by simple intercrossing? Was the artist's pigment theory one that might be reasonably expected to act? or was the scientist with the spectrum right? for very queer things arise from the admixture of spectrum colours to the eye of Art, and that Nature herself was perfectly independent of any calculations on the matter was evident from the way she introduces brilliant scarlet, as in the Pelargonium, etc., when a pure white opaque ground is covered with a thin skin of dingy, semi transparent material which works the miracle  one could not hope to even remotely follow. However Art stuck to its colours, and the event proved reliable, the pure whites must be set to the credit of Nature alone, and both the yellows, the purples and blues shaded with these as was expected through Art experience. Crimsons, rich yellows, and bronzes had their rudiments in plants of species which were either wholly new, or had been previously unobtainable; and to whose aid I was, as must be surmised, entirely dependent upon the liberality, kindness, and interest of Sir M. Foster. With these new means at hand the possibilities of success were greatly forwarded. Many things which had previously seemed hopeless became accomplished facts, though not all at once visible, for Iris raising is a matter of many years' patience, and many pleasant surprises began to arrive. To describe the Irises which are the result of this inter-crossing of species, which, as regarded their parents, hail from all the alpine and sub-alpino districts of Europe, I have ventured to call them hybrid alpine Iris. One most say that they are rhizomatous plants, with practically evergreen leaves, four or five to a tuft, thin, flat, sword or sickle-shaped, 3 or 4 inches long at flowering-time, afterwards prolonged to (1 or 8 inches, and from half an inch to 1 inch wide, growing out towards the end of the rhizome on all sides, so that the tendency of the plant is to form a circular patch. The flowers are produced in early spring, as soon as the weather breaks and will allow of growth to be made, upon stiff, succulent stalks, which enable them to remain fresh for a long time without water after being cut, and standing from I to 8 inches, or in the tallest, 10 inches in height. The flowers are large, often larger than the plant which produces them, and are of similar shape to the German or summer-flowering Iris, with three upright petals, the standards, which in some of the varieties, however, lay flat open, and expose the 3-petaloid styles to view; the three lower petals, or falls, are pendent, sometimes contracted and tucked in, so to speak, and they all have a more or less conspicuous white, primrose-yellow, rich orange, or blue beard. In colour they range from the purest of white selfs, white st:indards and cream or yellow falls, white and blue, white and violet and purple, each being white, yellow or orange bearded ; primrose-yellow self, cream and canary-yellow to rich yellow, with conspicuous orange-scarlet beard ; blues from the palest porcelain to deep blue-purple, lavender, violet-purple and crimson self, and bronze and almost black. These, with many changes of smooth or folded petals, long or round, plain, unmarked, or covered with lines, dots, and tracery, make up a sudiciently varied amount of combination and change to please a fastidious taste, and all of them together maintaining a constant relay and succession of flowers from very earliest spring to the end of April or early in May. Indeed, if the weather is mild, they will begin during October, November or December to throw up fitfully one or two flowers. As A New Forced Flower. small pans or 3-inch pots ; and if in clumps larger sizes may be used, but they require very little soil whilst in pots, and are very impatient of much water until growth has well set in, so that it is best to err on the safe side. If grown in quantity for cutting, shallow boxes are equally satisfactory. In heat they will bloom from January to the end of March ; in a cold-house they commence early in March or end of February, and continue through to April. In all cases plenty of air should be given, especially when in bloom; for if in a close, stuffy temperature, a minute fungus besprinkles both the petals and leaves, and the remedy is, of course, ventilation. They do not make satisfactory growth in pots, pans, or boxes, and so they should be hardened off and replanted in the open ground as soon as the weather will permit, for it must bo remembered that they are hardy plants, accustomed to a rigorous climate. A free, rather gritty soil is perhaps the best, and provided there is no stagnant moisture about, they are not exacting; they have thriven in a stiff clay in a windy, exposed, and sunburnt situation, and in ordinary garden loam. Their roots are voracious feeders, and quickly interlace in all directions where the plant is happy; but if they get a rather dry, sunny bank, where it is too hot and dry for most things, their growth may be much smaller, but their flowers will gain greatly in refinement. There is, in fact, no difficulty about their culture, provided that it be understood. Weeds and the shade of trees or large plants are quickly fatal to them, as is stagnant moisture; but beyond this, they are happy almost anywhere  on rockwork, as edgings, small borders, old walls, etc. ; and as they are small, bright green plants, they give an added charm to any situation they may occupy. Their enemies, other than the conditions above stated, are chiefly the winter-slug, snails, and woodlice, the first two being very destructive. The latter is very insidious and troublesome if not looked after when the plants are grown in dry situations, as it makes its home underneath the rhizomes, or in the interior of the older decayed ones in the center, and feeds on the budding tips of the new roots just at the end of the advancing rhizome, which of course prevents its growth altogether; but these can be trapped or other-wise kept down, should llioy make their appearance. 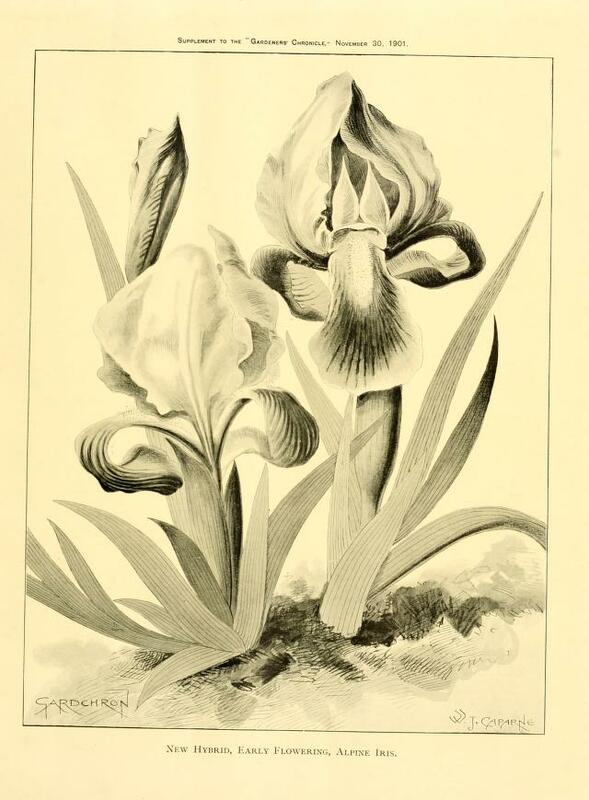 In conclusion, it is hoped that they may prove useful, satisfactory, and popular plants, for there are no special cultural difficulties connected with their culture, as is the case with most of the bulbous Iris, together with the magnificent group of Oucocychis Iris. With the new hybrids of " intermediate " Iris, which have caught the larger habit and flowers of the later, tall, bearded, summer-flowering Iris, together with many of their colours, but which have placed themselves in time of blooming in front of I. germanica, the tall, blue flag, whose group furnishes the advance guard of summer Iris, we may have a continuous display from the earliest days of spring, that endures without a break up to August. W. J. Caparne, Guernsey.